I was not among the critics who defied the embargo and went to “Spider-Man: Turn Off the Dark” before it closed down for an extensive overhaul under its new director, or as the credits have it, “creative consultant” Philip William McKinley. So I can’t compare this 2.0 revision (as it’s been dubbed) to Julie Taymor’s allegedly more fascinating if messy original. But the show as it stands now is still hardly one of the better musicals on the boards. And frankly, even if you choose to view the show as a new breed of entertainment – a theme park spectacle with elements of Cirque de Soleil – there’s no escaping the fact that this is a traditional book musical. And applying all the usual critical standards, it remains, I’m afraid, a not very good one. 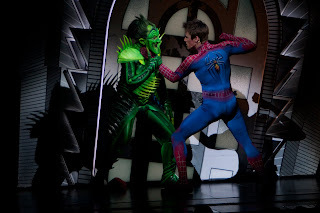 Spidey doesn’t take really wing until more than halfway through the first act (“Rise Above”), however, and it’s the second act that has most of the flying bits. There are several doubles for the flying, due to Carney’s extensive on-stage acting and vocal demands, but he gets his share of air time, too. 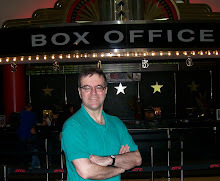 The show reminds me of nothing so much as those London spectacles of a couple of decades ago like “Time” and “Metropolis”: bombastic generic music (for so I judged the score by Bono and the Edge), and an unremarkable book (by Taymor, Glen Berger, and Roberto Aguirre- Sacasa). The principals are good. Carney has the lion’s share of singing culminating in his eleven o’clock number “Boy Falls from the Sky,” and makes an appealing protagonist. Damiano conjures Kirsten Dunst from the film, and proves a likeable Mary Jane. Ken Marks and Isabel Keating are appealing as orphan Peter’s loving uncle and aunt. Michael Mulheren’s one-dimensional “Bugle” editor grows tiresome, as the script gives him little to work with. Page has fun with the Green Goblin, but here again, the script undercuts the integrity of his performance. Is he a fearsome villain or a comic one? The script can’t seem to decide. A scene where he tries to leave a threatening message at “The Daily Bugle,” and runs into endless voicemail prompts, is jarringly out of keeping with the frightening aspects of his character we’ve seen up to that point. George Tsypin’s scenic design – a lot of expressionistic forced perspective cityscapes, including the Chrysler Building at the climax – is striking, if rather dark for the youngsters who make up such a large part of the audience. Eiko Ishioka’s costumes and Donald Holder’s lighting help sustain the visual interest.